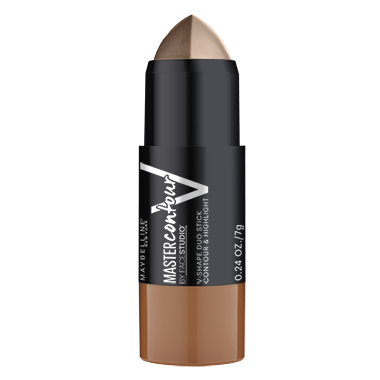 Create the illusion of structure and lift with the Maybelline Facestudio Master Contour V-Shape Duo Stick. The creamy matte formula blends easily to contour and highlight in an easy glide. Get the perfect V-shaped face with this easy-to-use contouring and highlighting duo. This 2-in-1 stick creates the illusion of structure and lift in two easy steps. Directions: For best results apply dark shade along the jawline and hallows of the cheeks and blend well. Then apply light shade to the high points of the face, like the tops of cheeks and bridge of nose, and blend well. The contouring shade is the perfect shade for contouring (not too warm). But I'm not too fond of the highlighter, as I like to use more pigmented highlighting products, so it gets a little tricky to apply when the contour side gets more worn down that the highlighter. I wish they made them separately but otherwise its a great product! Love this product! Easy contouring (slims my face) and concealer is more effective than one that I paid a lot of money for!